Recently my fairy godmother of age-proofing and hydrating supplements Kathryn Denzey ( founder of Rejuvenated Ltd, which created my favourite liquid collagen supplement Collagen Shots, as well as recently launched H3O that works on hydrating your cells – if you haven’t tried those already, there is nothing like the present to give it a go ) recommended someone truly lovely to me. Her name is Katy and she is the founder of the website called ‘Treat the skin you’re in‘ which has great videos and a blog where Katy talks about skincare, as well as sells NCN Professional products, one of which, Multi-active peptide matrixyl serum 25% I have been rigorously testing since the end of May. Katy has worked for Virgin Atlantic for 11 years but in time Katy noticed that her skin wasn’t looking its best and like any wise women started looking for solutions. Eventually she came across the brand NCN Professional Skincare and after using their products as a customer for three years she decided that she actually wanted to sell the products, having seen the difference they made to her skin. Until Kathryn and Katy mentioned NCN I wasn’t familiar with the brand at all but Katy kindly send me a serum to try and I must say that it turned out to be one of the nicest serums I have tried lately. NCN range comprises of multiple products, including cleansers, toners, serums, cleansing bars and other products that address the multitude of skin problems for women of all ages. 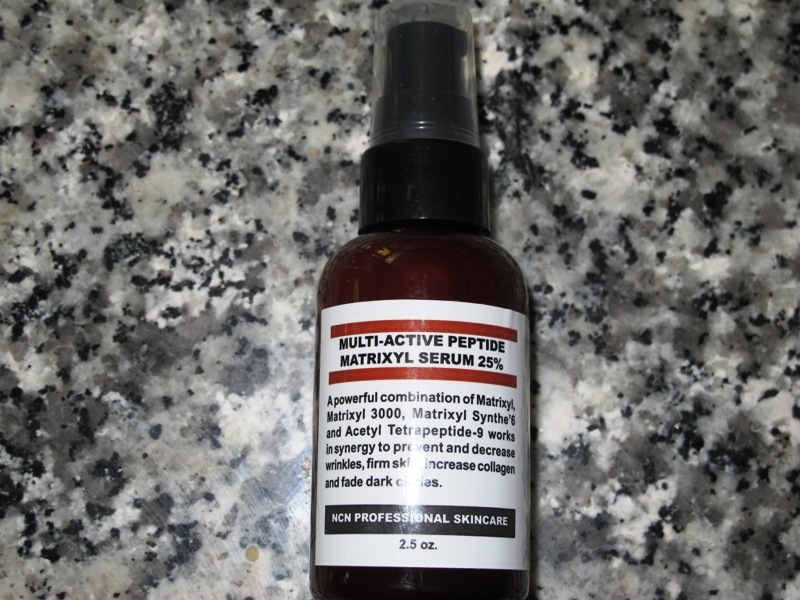 The serum that I am eager to tell you about is called Multi-active peptide Matrixyl Serum 25%. The serum itself is white in colour and feels like a feather-weight version of regular serum you already might have on your bathroom shelf. It has a very light fragrance and initially I was a little sceptical but intrigued that you can use it not just on your face but also on your neck, chest and even eye-lids. The serum also contains an ingredient that is very new to me, called Matrixyl ( Palmitoyl pentapeptide ) and in actual fact this serum is made up of a combination of Matrixyl, Matrixyl 3000 ( Palmitoyl terapeptide which inhibits & helps reverse glycation damage) and Matrixyl Synthe 6 ( the latest addition to matrixyl family which is a deoxygenated lipopeptide that stimulates synthesis of six major ingredients within the skin, notably Collagen I, III & IV, as well as heat shock proteins, laminins and hyaluronic acid ) all of which work well on their own but their effect is cumulative & synergetic when they are combined. – improve your eye area, reducing dark circles – a long list of promises, wouldn’t you agree? My initial impression was ‘well, have no expectations, let’s see what happens’. Throughout my trial I used the serum in the evening, under my usual night moisturiser. After a few weeks I thought that my skin definitely looked plumper and smoother, so I decided to experiment and use the serum on its own, to see if I will continue to notice the difference and I must admit that it works equally as well on its own – when I wake up my skin looks even, plump & radiant. I don’t use eye products on my eyelids, so didn’t put this to the test with the serum but it certainly is handy when you can use a serum on your face, as well as your eye area, especially when you travel and don’t want to pack too many skincare products with you. I like products that multi-task effectively and this is definitely one of those marvels. Its lighter texture than moisturiser is perfect for warm months of the year and when it gets cold you can ‘top it up’ with your moisturiser or face oil, if you feel that you skin needs it. Ingridients: active ones – Matrixyl, Matrixyl 3000, Matrixyle Synthe 6, Acelyl Tetrapeptide-9. Other ingredients: De-ionised water, Aloe leaf gel, Vegetable glycerine, Cucumber fruit extract, Grape fruit extract, Chamomile flower extract, Camelia sinensis ( japanese green tea ) leaf extract, Wild mushroom extract, Soy-rice peptides, Pepha-Tight, Chrysin, Hydroxysuccinide, Stereath-20, Polysorbate-20, Optiphen. Multi-Active Peptide Matrixyl Serum 25%, 70 mls, £65.99 available to purchase here. Postage is free on orders over £100.